Portsmouth caretaker boss Andy Awford says he would consider taking on the job full-time as the club continue their search for a new manager. 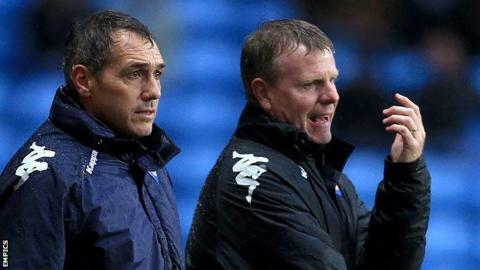 Pompey sacked Guy Whittingham on Monday after just over one year as boss. Academy boss Awford will take charge of the team in the short term but says he has not ruled out taking on the job permanently - if he is wanted. "If I was offered the job it is something I would seriously consider," Awford told BBC Radio Solent. The club held a board meeting on Thursday which was described as "very productive" by a senior member. At that meeting the board drew up a long list of potential targets, including former Premier League managers, and initial discussions about those candidates has begun. Awford said the squad were "disappointed" by Whittingham's departure, with one player contradicting the board's statement on Monday that he had lost the confidence of the players. The player said Whittingham still had the "full respect of the team" and "had not lost the dressing room" and "the squad were fully behind him". He added: "I feel for Guy, he had to put up with a lot." Awford added: "We need to move forward, and put it behind us and get some points and climb the league." The board outlined their vision of what they are looking for at Thursday's meeting, and they hope to appoint "someone who can build the club from top to bottom and who has a clear vision and strategy of how to earn success". They have also been impressed with the calibre of candidates already who stretch as far as the United States with the son of ex-Pompey manager Alan Ball - Jimmy - among the applicants. Former Crawley manager Richie Barker was also discussed at the meeting, an appointment senior players would welcome. Awford, who turned down the assistant manager's job 12 months ago, would be interested in the top job, but says he will not actively pursue the role. "Until I'm offered it, I will continue to do the best I can," he said. "If I'm offered it I will consider it, I'm not saying I will take it, I will consider it. If they go elsewhere that is absolutely fine." The board will wait until the end of the seven-day period they have set before they whittle down the candidates on Tuesday. At that point they hope to conduct interviews with the view of appointing on Thursday or Friday. However, the board insist they will not be rushed. Their search is slightly complicated as the club have to appoint someone out of work as they are not able to pay compensation because of the terms of their agreement with the Football League for coming out of administration. "They have said 'take care of the team up until the Wycombe game (4 December) and we will make a decision after that'," added Awford. "We then have a free weekend as we are out of the FA Cup so if they can then appoint a manager in that extended period he can then have a right few training sessions to assess the squad."